We had friends over for dinner a month or so ago. As is the norm in the summers, I had Fresh Fork Market food to use. I had linguini from a few weeks prior which I’d frozen. One of our guests was of Italian descent, so I was a bit nervous about serving him pasta. While I had a lot of tomatoes and was tempted to make a tomato sauce, I’ve never really made pasta and tomato sauce before. But I’ve been very successful with pesto, so I decided to go that direction. Indeed, it was a hit! I cut the onion into bite-sized pieces and cooked it on the stove. I tried to caramelize it; unfortunately, the onions we get from Fresh Fork don’t seem to caramelize well. Typically, yellow onions are best for that. I also added the (sliced) tomatoes and artichokes into the same pan for a little while. Neither was really fully cooked, but a little bit softer than they would have been fresh, which worked well with the dish. The almonds, basil, olive oil, and garlic went into the food processor. Pesto is extremely simple to make! I cooked the linguini as instructed on the package, drained, returned it to the pot, and added the pesto and vegetables. Voila! A few weeks later, again we had guests, and again we had Fresh Fork linguini. This time, I made roasted tomato pesto – probably even a step above this one, honestly! Amazing. 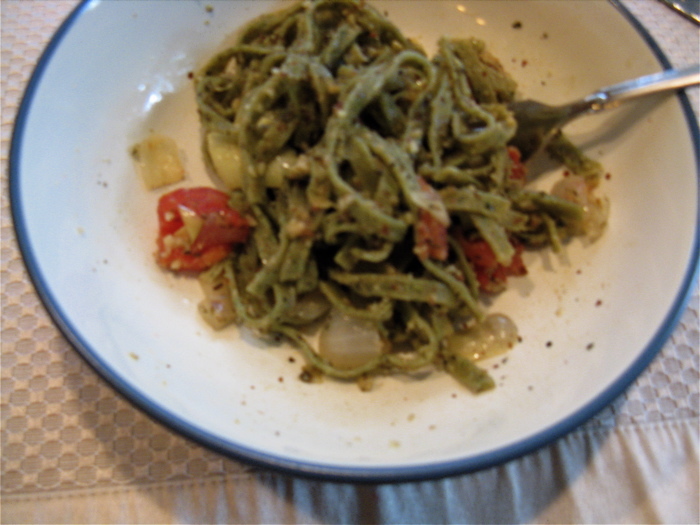 This entry was posted in Dinner, Fresh Fork, Recipe and tagged linguini, pasta, pesto.